Ikiryō, or shōryō, seirei, ikisudama (生霊, lit. "living ghost," "eidolon"), in Japanese popular belief and fiction, refers to a spirit that leaves the body of a living person and subsequently haunts other people or places, sometimes across great distances. The term(s) are used in contrast to Shiryō, which refers to the spirit of those who are already deceased. The popular belief that the human spirit (or soul) can escape from the body has been around since early times, with eyewitness accounts and experiences (hauntings, possessions, out-of-body experience) reported in anecdotal and fictional writings. Vengeful spirits (怨霊, onryō) of the living are said to inflict curses (祟り, tatari) upon the subject or subjects of their vengeance by means of transforming into their ikiryō form. It is believed that if a sufficient grudge is held, all or part of the perpetrator's soul leaves the body, appearing in front of the victim to harm or curse them, a concept not so dissimilar from the evil eye. The ikiryō has even made its way into Buddhist scriptures, where they are described as "living spirits" who, if angered, might bring about curses, even just before their death. Possession is another means by which the Ikiryō are commonly believed to be capable of inflicting harm, the possessed person thought to be unaware of this process. However, according to mythology, the ikiryō does not necessarily act out of spite or vengefulness, and stories are told of the ikiryō who bears no grudge, or poses no real threat. In recorded examples, the spirit sometimes takes possession of another person's body for motives other than vengeance, such as love and infatuation (for example the Matsutōya ghost below). A person's ikiryō may also leave the body (often very shortly before death) to manifest its presence around loved ones, friends and/or acquaintances. In classical literature, The Tale of Genji (ca. 1000) describes the "well known" episode of the ikisudama (the more archaic term for ikiryō) that emerged from Genji's lover Lady Rokujo, and tormented Genji's pregnant wife Aoi no Ue, resulting in her death after childbirth. This spirit is also portrayed in Aoi no Ue, the Noh play adaptation of the same story. After her death, Lady Rokujo became an onryō and went on to torment those who would later become Genji's consorts, Murasaki and Onna-sannomiya [ja]. Konjaku Monogatarishū contains the tale of "How the Ikiryo Spirit of Omi Province Came and Killed a Man of the Capital." In the tale, a commoner encounters a noblewoman and guides her to the house of a certain Senior Assistant Minister of Popular Affairs (民部大夫, Minbu-no-tayū) in the capital. Little did the guide know that he was guiding the ikiryō of a woman to her neglecting husband. Upon reaching the house the lady vanishes, though the gates remain shut. Wailing noises are heard inside the house. The following morning, the guide learns that the master of the house had complained the ikiryō of his former wife was present and causing him illness, shortly after which he died. The guide later seeks out the lady's house in Ōmi Province. There a woman speaks to him through blinds, acknowledging the man's services that day, and showers him with gifts of silk cloth. The ikiryō can also possess the object of its infatuation, who is neither rival nor enemy. 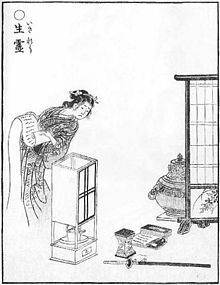 The "Matsutōya yūrei",[b] a tale allegedly based on events that occurred during Kyōhō 14 or 15 (1729–30), a Kyoto merchant named Matsutōya Tokubei (松任屋徳兵衛) had a teenaged son named Matsunosuke possessed by the spirit of two women who loved him, and who tormented the boy's conscience. On occasion, he would be suspended in mid-air, engaging in conversation as if the girls were present before his eyes, the ikiryō's words being spoken through the boy's lips. Finally the family sought help from a renowned priest named Zōkai. [c] The priest successfully exorcised the boy and cured his condition, but rumors had already spread regarding the incident. Sightings of ikiryō belonging to those whose deaths are imminent have been recorded from all over Japan. Stories abound of spirits that materialize (or otherwise manifest their presence) to someone dear to them, such as immediate family. The recipient of the visit experiencing a metaphysical foreshadowing of this person's death, before any tangible news of bereavement arrives. In the tradition of the Nishitsugaru District, Aomori Prefecture, the souls of the person/s on the brink of death are called amabito, and believed to depart from the body and walk around, sometimes making noises like that of the door sliding open. According to Yanagita, tobi-damashi (飛びだまし) is the equivalent term to the Senboku District, Akita region. Yanagita defines this as the ability of certain persons to traverse the world in their Ikirȳo form. Such individuals are purported to have voluntary control of this ability, in contrast to those who are only temporarily capable of tapping into such a state as a precursor to their death. In the Kazuno District in Akita Prefecture, a soul that pays visit to acquaintances is called an omokage (面影〔オモカゲ〕) "reminiscence, lingering shadow", and assumes the form of a living human, that is to say, it has feet and make pitter-patter noises, unlike the stereotypical Japanese ghost that have no legs or feet. Yanagita in Tōno monogatari shūi reported that in the Tōno Region, Iwate Prefecture, "the thoughts of the dead or the living coalesce into a walking shape, and appear to the human eye as an illusion is termed an omaku in this region." An example being a beautiful girl aged 16 or 17, critically ill with a case of "cold damage" (傷寒, shōkan) (Typhoid fever or a similar disease). She was seen wandering around the construction site of the Kōganji temple rebuild project in Tsujibuchi, Iwate [ja], the days before her death. In Kashima District, Ishikawa on the Noto Peninsula, a folklorist recorded belief in the shininbō (死人坊), said to appear 2 or 3 days before someone's death, which was seen passing through on its visits to danna-dera (The family temple, also called bodaiji). The temple was believed to be the soul's final resting grounds, where one finds a place amongst their ancestors. One case of a near-death hitodama deemed 'suitable for discussion' under the topic of ikiryō by a folklorist closely resembled the aforementioned tale of the woman's head in the "Sorori Monogatari", namely, that the subject who witnessed the soul's apparition pursued it ruthlessly, until he discovered the owner of the soul, who claimed to have seen the entire experience of being chased during a dream. The subject worked at the town office of Tōno, Iwate, and one night, he reported seeing an hidama emerge from a stable and into the house's entrance where it was 'flying around'. He claimed to have chased it with a broom, and trapped it beneath a washbasin. A while after, he was rushed out to see his sick uncle on the brink of death, but he made sure to release the fireball from its trapping. He soon learned that his uncle had only just died, but his uncle came back to life again, enough so to accuse the nephew of chasing him with a broom and capturing him. Similarly, the folklore archives of Umedoi, Mie Prefecture (now part of Inabe) tells a tale about a band of men who, late in the night, spotted and chased a fireball into a sake warehouse, waking a maid who was asleep inside. The maid later professed to being "pursued by many men and fleeing" to take refuge in the warehouse. Rikonbyō (離魂病) from the Kyōka Hyaku Monogatari illustrated by Masasumi Ryūkansaijin. The woman on the left is afflicted by the "soul separation illness", and her ikiryō appears next to her. During the Edo period, there was a belief that there was a condition called rikonbyō (離魂病) "soul separation illness", whereby the soul would not just separate from the body, but assume the shape and appearance of the sufferer. The condition was also known interchangeably as shadow-sickness (影の病, kage no yamai), alternately written as kage-no-wazurai (カゲノワズライ). This affliction is treated as an instance of ikiryō by folklorist Ensuke Konno in his chapter on the topic. The case study example is that of Yūji Kita, doomed by the kage no yamai for three generations in succession, recorded in the Ōshu banashi (奥州波奈志, "Far North Tales") by Tadano Makuzu (d. 1825). The identical double might be seen by the sufferer or be witnessed by others, and can be classed as a doppelgänger phenomenon. Others have reported a sort of out-of-body experience, whereby their consciousness inhabits the ikiryō to see their own lifeless body. The ushi no koku mairi (丑の刻参り) is, when one, in the hour of the ox (1AM to 3AM), strikes a nail in a sacred tree, and thus becomes an oni while alive, and using these oni powers, would inflict curses and calamity upon a rival. Although many ikiryō generally are spirits of humans that leave the body unconsciously and move about, deeds akin to performing magic rituals and intentionally tormenting a target can also be interpreted as ikiryō. In the same way, in the Okinawa Prefecture, performing of a magic ritual with the intention of becoming an ikiryō is termed ichijama [ja]. ^ Another example of this term occurs in the verse by the poet Izumi Shikibu which depicts the author's soul as a wandering firefly: "While I am rapt in thought, / The fireflies of the marsh would seem to be / My soul, caught up and wandering / Forth out of me." (Goshūi Wakashū, Tale 20). ^ cf. the yōkai monster known as nukekubi. ^ While terms such as tobi-damashi or omokage, Akita, or shininbō are used in the Ishikawa Prefecture in isolated cases, these terms are not frequently used anywhere elsewhere. ^ Konno 1969, pp. 44–46 describes cases of floating balloon-like objects of yellow color (iridescent colored, according to Konno) an omen of death. The locals in the Shimokita District, Aomori refer to the object as tamashi (タマシ) "souls", the same term in common usage by locals in Komena hamlet, in the town of Ōhata. On the day after a sighting of one heading towards the mountains (Mount Osore) on April 2, 1963, a boy died in the hospital from injuries he sustained falling off a bridge while double-riding a bicycle. ^ a b Shinmura, Izuru (新村出), ed. (1991). Kojien [Kojien] (4th ed.). Iwanami. p. 122. ISBN 978-4-00-080101-0. ^ Bargen, Doris G. (1997). A Woman's Weapon: Spirit Possession in The Tale of Genji. University of Hawaii Press. p. 166. ISBN 978-0824818586. ^ Kojien dictionary, akugaru, sense 2. ^ Miyamori, Asatarō (ed. tr.) (1956). Masterpieces of Japanese Poetry: Ancient and Modern. 1. Taiseido Shobo Company. ^ Dykstra, Yoshiko Kurata (tr. ), ed. (2003). "Book 27, Chapter 20: How the Ikiryo Spirit of Omi Province Came and Killed a Man of the Capital". The Konjaku Tales: From a Medieval Japanese Collection. Japanese section. 3. Intercultural Research Institute, Kansai Gaidai University Publication. p. 95–. ISBN 978-4873350264. ^ Haga, Yaichi (芳賀矢一), ed. (1921). "Book 27, chapter 20, Ōmi-no-kuni no ikiryō Kyō ni kitarite hito wo korosu, no katari 近江國生靈來京煞人語". Kōshō konjaku monogatari shū (in Japanese). 3 (下). pp. 367–. ^ Kanzawa, Teikan/Tokō (神沢貞幹/神沢杜口 1710-1795), ed. (1906). "Book 56 Matsutōya yūrei". Okina gusa 翁草. 6. 池辺義象 (revised). Gosharō shoten. pp. 66–7. ^ Yuasa, Yoshiko (湯浅佳子) (2009). 『曾呂里物語』の類話 [A Study of a similar story of "SORORI-MONOGATARI"]. Bulletin of Tokyo Gakugei University, Humanities and Social SciencesI (in Japanese). 60: 307–309. hdl:2309/96207. ISSN 1880-4314. ^ a b c Yanagita, Kunio (1970), "Chapter 77", About Our Ancestors: The Japanese Family System, Fanny Hagin Mayer (tr. ), Greenwood Press, p. 171, ISBN 9780313265525, There are also many instances reported, especially when facing death, of men materialising in front of a chosen loved one or associate. In Senhoku-gun such people are called amabitoand individuals who can 'fly anywhere in their dreams' are called tobi-damashi [flying soul], the same term used in Tsugaru,..
^ Yanagita, Kunio (2004) . "Tōno monogatari supplements 遠野物語拾遺, Tale 160". Tōno monogatari (in Japanese). Kadokawa. pp. 146–151. ISBN 978-4-04-308320-6. ^ International Research Center for Japanese Studies (2002). "Shininbō シニンボウ". Kaii & yōkai denshō database (in Japanese). ^ Uezu, Hitoshi (上江洲均) (1994) . Ōtsuka minzoku gakkai, ed. Nihon minzoku jiten 日本民俗事典 [Japanese folk encyclopedia] (Pocket ed.). Kōbundō (ja). p. 41. ISBN 978-4-335-57050-6. ^ Shimabukuro, Genshichi (島袋源七) (1974) . "Sangen no dozoku 山原の土俗". In Ikeda Yasusaburō (ja); et al. Nihon minzokushi taikei. 1. Kadokawa. p. 373. ISBN 978-4-04-530301-2. Ikeda, Yasusaburō (池田彌三郎) (1978) . Nihon no yūrei 日本の幽霊 [Ghosts of Japan]. Chuokoron. ISBN 978-4-12-200127-5. Ōtō, Tokihiko (大藤時彦) (1955). 民俗学研究所, ed. Sōgō nihon minzoku goi 綜合日本民俗語彙 [Sogo Japanese folk vocabulary]. 1. 柳田國男 (supervising editor). Heibonsha. BN05729787. Konno, Ensuke (今野円輔) (2004) . Nihon kaidanshū; yūrei hen [Japanese kaidan collection: ghosts] (snippet). 1. Chuokoron-Shinsha. ISBN 978-4-12-204464-7. Tada, Katsumi (多田克己) (2008). "Chapter: Yōkai soran 妖怪総覧". In Natsuhiko Kyogoku. Yōkai gahon: kyōka hayakumonogatari 妖怪画本 狂歌百物語 [Yōkai picture book: satirical waka version Hyakumonogatari]. Kokusho kankōkai (ja). ISBN 978-4-3360-5055-7. Takada, Mamoru (高田衛), ed. (1989). "Sorori monogatari 曾呂利物語". Edo Kaidanshū 江戸怪談集 [Edo ghost story collection]. 2. Iwanami. ISBN 978-4-00-302572-7. Visser, Marinus Willem de (1935). Ancient Buddhism in Japan. 1. Leiden: E.J. Brill. This page was last edited on 11 April 2019, at 02:54 (UTC).